The Aquapac waterproof iPad case offers guaranteed 100% waterproof protection for your iPad. The Aquapac waterproof iPad case has been professionally tested by the British Standards Institute. The case is marked BSI marked IPX8 which means it is tested against long periods of immersion under pressure. 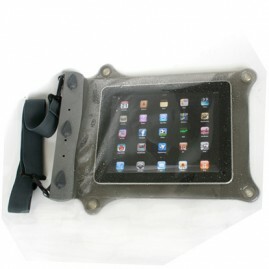 This waterproof iPad case is suitable for immersion for at least 30 minutes to a depth of 5 metres. Just ask the London Fire Brigade, Los Angeles Life Guards & Japanese Coastguards whose waterproof cases they rely on to keep their gear safe. 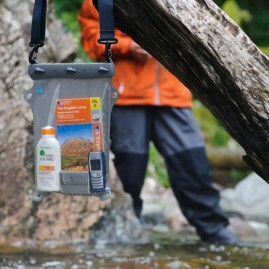 Moreover Aquapac waterproof cases have the markets lowest warranty return rate 0.05%. These are the most reliable cases we have sold in the past few years. No other manufacturer offers a 5 year warranty against defect. Aquapac simply offer the most reliable case to keep your iPad waterproof. This Aquapac Large Electronics Case 668 case can be used with most computer tablets as well as the iPad. 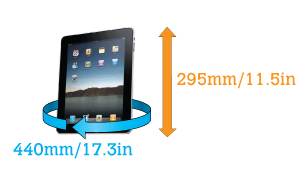 The unit is generic sized case that allows the iPad and other similar computer tablets to easily fit. Fits popular PC tablets including the Apple iPad and iPad2, the BlackBerry PlayBook, the Motorola Xoom, and the Samsung Galaxy Tab. Dimensions 22.5cm wide by 29.5cm long. As well as a waterproof iPad case it is also a great way to protect and carry all sorts of gear - phones, cameras, passports, etc. It comes with handy adjustable shoulder strap. Also protects all manner of dust, dirt and sand. Like most of our cases it'll float if you drop it in the pool.